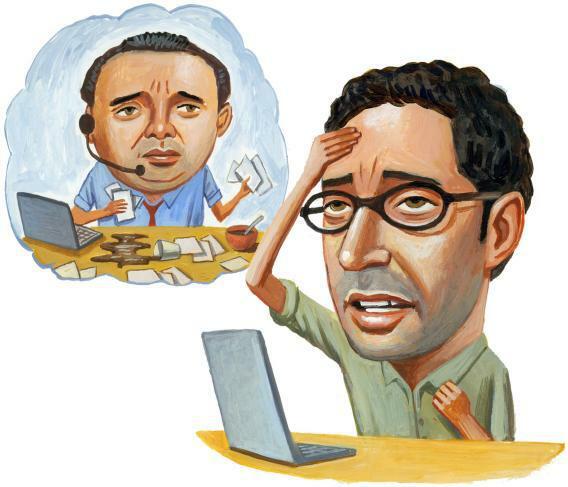 Hiring an online personal assistant: A potential time-saver becomes a huge time-waster. I understand all of this in retrospect. (And I would have understood already if I’d read Maria Semple’s acclaimed novel Where’d You Go, Bernadette, wherein the perils of hiring a remote online assistant are a major plot point—but if I’d had time to read it, I wouldn’t need a remote online assistant.) In my defense, though, let me say this: I had a dream. Some people yearn for wealth, others fame. Me, I’ve always aimed for a life free of annoyance, of drudgery, of all of the little pointless things you’ve got to do to keep living and working—things like answering email and changing out of your pajamas and making sure you show up to appointments on time. During the course of my professional life, I’ve gotten better at doing these things (except for the pajamas), but it’s never fun, and I’m always teetering on the edge of work-life chaos. Thus my personal definition of success: If I ever achieved a station in life that would allow me to pay other people to do the things I hated doing most, that’s when I’d know I’d made it. I can’t remember how I first heard of outsourced Indian assistants. Something caused me to Google it, and when I landed on TasksEveryDay.com—one of several firms offering such services—I knew I’d have to try it out. This was late last year. My wife and I were about to have a second kid, and we both felt barely able to cope with just one. I estimated that mindless but necessary tasks took up at least five hours of my week. If I could shrink that by half—or, in my dreams, to nothing—I’d be in heaven. Three years ago I tried out a couple virtual-assistant services based in America, and I found them to be awesome. But those sites—Fancy Hands and TaskRabbit—are best for handling a few tasks per month; I wanted a more permanent assistant, someone who’d be there at least an hour or two each day to help me with whatever I needed. TasksEveryDay promised just such a service for around $10 an hour, which is about half the rate I’d have had to pay a personal assistant in my area. Looking at the site now, I see things that should have clued me in to the possibility that the rates weren’t low just because of global labor arbitrage. It’s rife with clip art, its marketing copy is riddled with not-quite-correct punctuation and capitalization, and customer testimonials bear more than a passing resemblance to hostage videos. But in my stupor I was blind to these flaws. What’s more, my negotiations with the company’s sales representative went smoothly. The woman on the phone was polite, spoke English fluently, and expertly soothed my fears about how the site’s assistants would handle my personal data. In addition to a nondisclosure agreement, the company constantly monitors its workers’ online activities, its call center is outfitted with surveillance cameras, and assistants aren’t allowed to install any storage devices (like USB disks) into their computers. I was sold. At 9 a.m. the next day, I shared my Google Calendar and Gmail accounts with Mr. F, and I gave him his first task. I needed a flight from San Francisco to Minneapolis. I gave him my dates. I wanted times and prices. Once he’d found an ideal flight, I planned to give him my credit card number so he could book it for me. Huh. This task should have taken him about 10 minutes; why was he just getting started after a nearly an hour and a half? Around noon—about three hours (and $30) after I’d assigned the task—Mr. F finally sent me an email to say he was done. Now I saw why he’d taken so long: Instead of looking for the best two or three flights that conformed to my calendar, he’d created a spreadsheet listing all the details of 10 flights. This was madness: I could have gotten a similar list myself in 30 seconds on any travel site. What I needed was someone to help me narrow down my options, not replicate a Web search. And why did he think I’d need an Excel version? Why didn’t he just send me a link to his search? I chalked it up to first-day troubles. The weekend was coming up, and I didn’t need Mr. F on Monday morning. I told him to be ready to work on Tuesday. But on Tuesday I heard nothing. Not on Wednesday either. The whole week passed. Then another week. If I had a personal assistant, I would have had him call up TasksEveryDay to find out what kind of two-bit operation they were running. But I had no such help, so the task of calling up the firm to complain was added to a dozen other low-priority tasks on my to-do list. I did revoke Mr. F’s access to my Gmail and calendar. About a month after his first and only day on the job, I got an email from Mr. F asking if I needed anything done. He made no mention of the mysterious monthlong hiatus. I told him to stuff it and asked to speak with his manager. When the manager emailed, I asked for a refund. (Oh, did I mention I’d prepaid for 40 hours? Yes, I did. Because that was a better deal, and I am always looking for a good deal.) The manager explained that a refund was “not possible,” but he’d be happy to set me up with another assistant. Mr. P was not a total wreck, but that was mostly because I’d been so chastened by my experience with Mr. F that I gave the new guy only the most mindless tasks I could think of. I asked him to call up American Airlines to find out how I could use a credit for a flight I’d missed. He got an answer within half an hour. I asked him to call up my bank to ask about a charge on my account. For security reasons the bank wouldn’t give him any answers, but I appreciated his effort. It was obvious that Mr. P hadn’t really transcribed the interview—instead he’d fed it through transcription software, something I could have done myself. When I angrily complained, he said, “I got your email, ok I will do the transcription again manually.” It took him about 8 hours to do the hourlong recording. He didn’t insert any paragraph breaks. By the end of my time with Mr. P, I was having trouble coming up with tasks to give him. Pretty much everything that I’d find truly helpful—looking through my email to politely decline invitations and requests I’d been sent, or to figure out whether and when I could take certain meetings, or to remind me to reach out to so-and-so for such-and-such—was off-limits. These tasks were either too delicate, requiring more deftness with the language than he seemed capable of, or too personal, requiring more knowledge about my work, industry, and life than I wanted to share. At some point it dawned on me that I’d stumbled upon the fatal flaw inherent in any virtual-assistant relationship. To be truly useful, an assistant needs to understand everything about your life and work. An assistant is a confidant. But it’s impossible to develop a deep, trusting relationship with a guy you know only by email—a guy who communicates with you in canned professional-ese, who must be monitored by security cameras to make sure he doesn’t rob you. TasksEveryDay’s assistants were pretty terrible, but even if they’d flawlessly handled every task I’d given them, they wouldn’t have been nearly as good as a local person. That person would cost a lot more. But it’d be worth every penny.